You get varieties of mangoes during summer and I always make thokku this season.I never buy pickles in the market as they contain too much oil, salt and preservatives and they are not as fresh as homemade ones.I am very good in making pickles and learn't it from my mother who is an expert in it. Preparing pickles at home is very simple and any one who has not tried making it at home before can try this easy recipe.Today we will learn how to make South Indian Mango thokku following this very simple mango thokku (pickle) recipe. Wash mangoes well and wipe it dry. Peel the skin and grate the mangoes using a grater. Dry roast fenugreek seeds in a pan (do not brown it) and powder it. Keep it aside. Then only you should add chilli powder and salt. After adding chilli powder and salt, saute nicely till oil separates.Keep it in low flame otherwise it will get burnt. Then add fenugreek powder, mix well and switch it off. Leave it to cool. Store it in a dry container and refrigerate it. It can be used as a condiment for curd rice, paratha, bread, sandwich, idli etc. It will last a month though in my house, it will be over within a week. Do not forget to check out varieties of Pickle Recipes in my site. It is preferable to use sesame seed oil for making pickles. 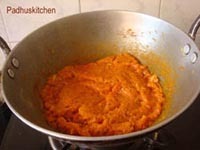 Use dry spoon and take only needed quantity from the refrigerator. Store it in a clean and dry bottle or container. Do try this and let me know how it turned out. Meet you all with more interesting recipes. Sending this recipe to Anjali's Cooking made easy with mangoes. My granny used to make this. She used to pickle the mangos and make mango tokku by grating mango pulp which is adearing to seed, so that nothing goes waste. Can I use thotapuri mango for this tokku? This is a simply wow recipe, so easy and still so tempting. I'll be glad to see this in my event. Lip-smacking and super alluring thokku !! Tangy tasty thokku.. I love this one the best among all the pickles. Manga thokku is always a comforting pickle and it feels like summer when you eat it. Padhma, I love your wok too. Its so perfect to make sweets. nice presentation padhu. i made recently managi thoku. but whole methi seeds added not the powder. as you said nallennai is always better but my family members don't like it. even for adai i love it. varieties, chettu mangai, vadu mangai, kanni mangai, cut mangoes mixed with salt and dried. (ada mangai) later u can make pickle out of it, or vathakuzhampu etc. delicious mango pickle...love the fact that its an almost instant pickle! 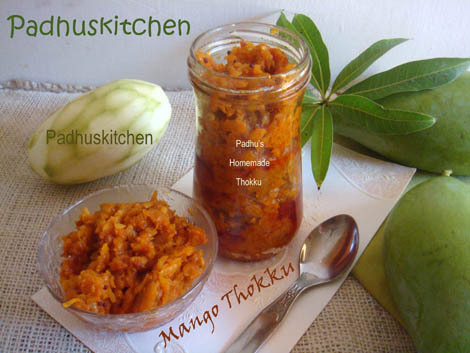 I love mango everything and this thokku looks absolutely delicious! Have not tried making this at home before. Is there a reason you only use powdered rock salt??? hi thanks for such sweet comment and and very glad to follow ur blog..
Lovely clicks Padhu.. Seems very spicy.. Tried the recipe and it came out well. Thanks for sharing. I tried the same with with mango slightly ripened ( bit sweet and sour) in pulp form ( not grated, grinded in a mixer) and with Jaggery, little 1/4 tea spoon of sambar powder too... It tastes divine with chappati, dosa.. Done and it tastes amazing. Tried it with previously salted baby mangoes coarsely blend . Had to stir for a longer time time to get rid of the water. Did I miss the hing? Can't find Wher to to add it! Tried above recipe and it came out yummy taste . Thanks for sharing. Thokku will not last for 6 months. Maybe a month or two in the refrigerator. You can try various Mango Recipes. Happy to know. 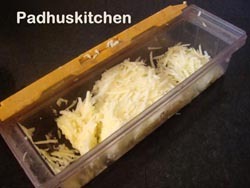 You can send the picture to Padhuskitchen facebook page. I will publish it there. Hai padhu ism priys.i have tried receipes as per Ur method.it all came iuf very well and it's easy to prepare .thanks.